Hyvää Pyhäinpäivää. Tervetuloa viikon Allsorts haasteen pariin! Värihaasteena yhdistelmä sininen ja ruskea! Isänpäivä on jo viikon päästä, tässä olisi kalamiehelle sopiva kortti. Jäätkin sulivat sopivasti viime yönä. Happy All Saints day! Time for a new Allsorts Challenge! This week we have a colour theme: Blue and Brown! Our Father's Day is on next Sunday. It's a perfect masculine card using the PB image Mervi. Your Fathers Day is late, our's is in June. 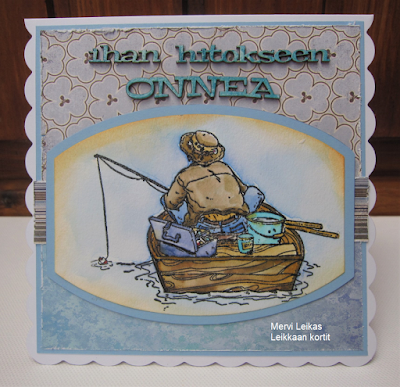 Super image Mervi and some lovely papers, great shape of die too. What a great masculine card Mervi. Perfect image and colors! Your fishing card is fabulous, great design for a masculine creation. Mervi, what stunning male orientated card you have created. Nice subtle colours. It fits the Colour Crazy Challenge this week. Thank you for taking part and best wishes in the draw. Kym (Colour Crazy Challenge Guest Designer). Love everything about this! Thanks so much for sharing with us in the Crafty Catz "Beartastic" challenge!